Bottom barriers were placed on three-quarters of an acre in the Tahoe Keys this July to help kill off invasive aquatic plants. Scuba divers installed nearly 140 bottom barriers earlier this month, covering over three-quarters of an acre, in one of the Tahoe Key’s lagoons — the beginning of a multi-year, strategic plan to eradicate the invasive aquatic plants that have taken over the man-made waterways. 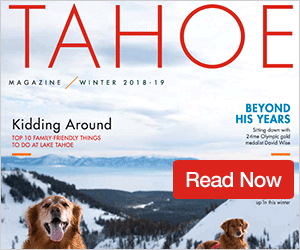 The Tahoe Keys were created in the late 1950s by dredging an estimated 5 million cubic yards of material from the marsh at the mouth of the Upper Truckee River. The effort destroyed much of the river’s marsh, a major filtration system from Lake Tahoe’s largest tributary. The resulting 172 acres of warmer, calmer lagoons became prime habitat for aquatic invasive plants like Eurasian milfoil and curly-leaf pondweed, which now cover more than 90 percent of the channels. For the past two years, sun-blocking bottom barriers have been used in a smaller capacity at the docks of individual homeowners. The most recent installation is the largest use of the barriers in the Keys. They will remain in place no later than Oct. 15, but will be put back again during the warmer months for the next two years. 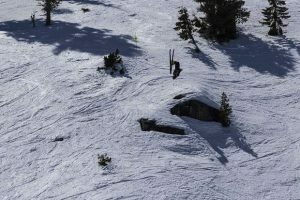 This is all part of a long-term plan that has been gaining momentum over the last few years due to efforts by the Tahoe Keys Property Owners Association (TKPOA). Over the past 30 years, the main method of controlling the weeds has been harvesting and fragment collection. 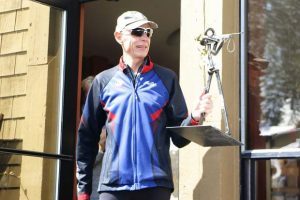 “(The year) 2015 is when everything really took off and we started to try and control everything,” said Greg Hoover, TKPOA water quality manager and aquatic invasive species management coordinator. “There were spurts in the past where we’ve incorporated science into this, but in 2015 we brought in a consultant agency and a scientist that has a Ph.D. in aquatic plants.” Hoover’s position was created in 2016. He now manages the day-to-day weed-harvesting schedule in the lagoons as well as the bigger picture plan for getting the plants under control. This year TKPOA, which collects fees from the 1,529 homeowners, put out a vote asking residents if they would be willing to pay $1,600 over three years to fund the aquatic invasive species program. “Almost 60 percent said ‘yes,’” noted Hoover. TKPOA now has $2.4 million — with the possibility of more through grants — to run its program. Part of that program potentially includes small-scale testing of herbicides. This past January, TKPOA applied for a permit to test low levels of three herbicides — Endothall, Triclopyr and Penoxsulam — at nine test sites in 2018. The test sites would cover about 13 acres, or 8 percent of the Keys, and would be in dead-end lagoons far from the lake. A decision by the U.S. Environmental Protection Agency in September 2015 determined that some herbicides may be approved for use on a case-by-case basis in Lake Tahoe. 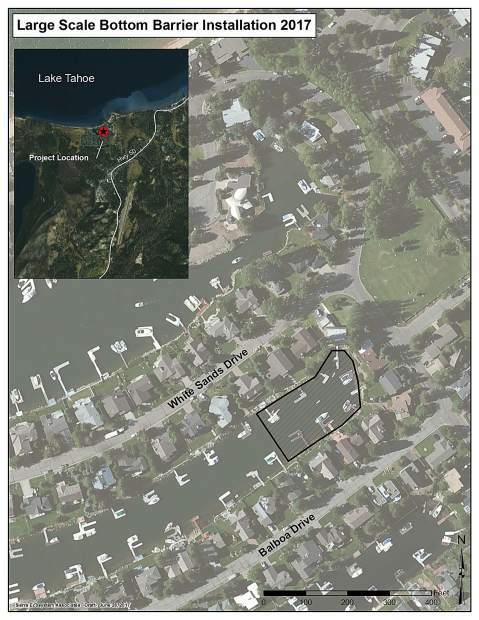 According to TKPOA, the test sites would have multiple surface-to-bottom barriers to ensure the herbicides, which are considered nontoxic to humans, fish and wildlife, would not reach the lake. The herbicides break down by light, microbial action and other processes within a few days to two weeks. Hoover said that if the permit is approved for the trial, and the results are promising, herbicides could be used as a method for weed eradication in the Keys starting in 2020. “The plan is that in 2023, 80 percent of this is gone, and it’s in a manageable state where the only thing that we really have around here is the native plants,” said Hoover, noting that this estimate is contingent on a number of variables. In the meantime, TKPOA has taken other measures to reduce the spread of invasive plants, including purchasing a $100,000 skimmer boat that trolls the lagoons with a large net to catch weed fragments. Last year, a small boat back-up station was tested, giving boats a space to reverse and clear their propellers of plants before heading out into the lake. This year, a larger station is in the process of being set up. “Public opinion isn’t too high, but we are trying to take all the right steps to be able to fix the problem that was created when they created the Keys,” Hoover said. As for invasive animal species that have found a home in the warmer, plant-filled lagoons, TKPOA does not have the power to act on that, according to Hoover.